You are browsing the archive for Dave Follows. As well as the Shrewsbury Cartoon Festival, April also brings with it a long-awaited exhibition celebrating the life and work of the late Dave Follows. It takes place at the Potteries Museum and Art Gallery, Stoke-on-Trent, from April 19 – June 29. Dave, who died in 2003, left a significant legacy of artwork that spans three decades. His work appeared in newspapers, comics, and magazines all over the world, including the Sunday Times supplement Funday Times (weekly for 15 years), more than 20 local newspapers, such as the North Staffordshire Evening Sentinel (daily for 20 years), and Buster comic. Dave lived in Stafford all his life. He had a special soft spot for the Potteries and its people. 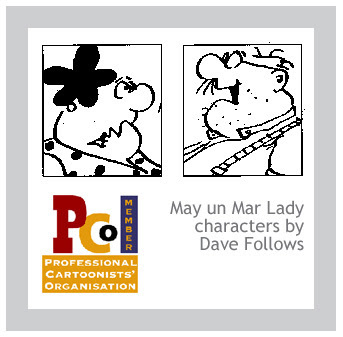 His daily cartoon strip May un Mar Lady, written in Potteries dialect, first appeared on July 8, 1985, in the Sentinel and was a local institution for nearly 20 years. The exhibition, May un Mar Lady: Three Decades of Cartooning by Dave Follows, includes a huge selection of Dave’s original cartoons, a reconstruction of his work area, life-size cartoon figures, a May un Mar Lady pilot animation, and a preview screening of a documentary exploring the Potteries dialect in the context of Dave’s cartoons by the Stoke-On-Trent based film production company Inspired Film And Video. 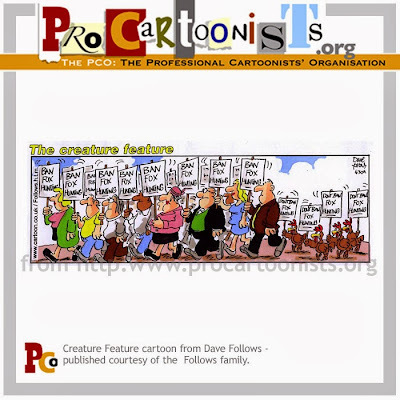 The family of the late Dave Follows has organised an exhibition to celebrate the cartoonist’s work and legacy at the Potteries Museum and Art Gallery, Stoke-on-Trent, from April 19 – June 29.